Mainly, I want to create an organized and functional landing strip that has a place to sit and remove shoes, a spot for keys and mail and coat hooks. 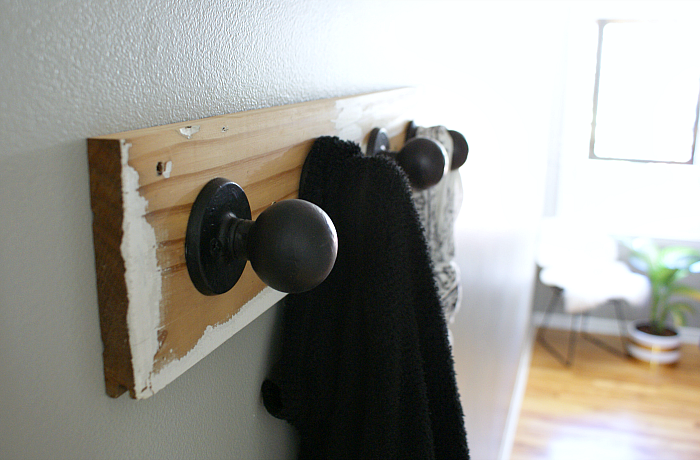 Jesse and I knocked out the coat hooks this weekend by mounting old doorknobs to a piece of salvaged wood. I coated the door knobs with plasti-dip which gives them a nice grippy texture and prevents coats from sliding off. 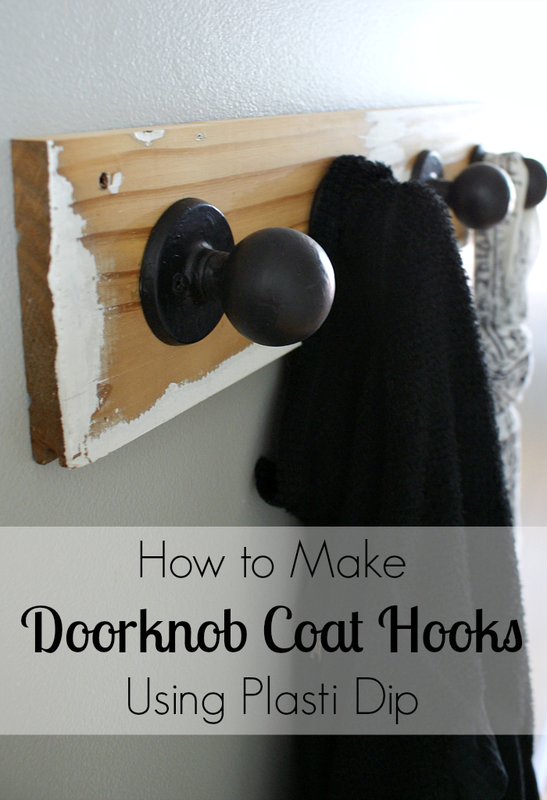 I started by purchasing a few old doorknobs from the Habitat Restore. They were having a Customer Appreciation event so my knobs were less than a dollar a piece! Also, if you do this, I would recommend going bold and opening up the bags to see what type of mechanism they have before purchasing. You want knobs that come apart easily. More on that in a minute. Next, I headed over to our local hardware store to buy a can of black Plasti Dip. I thought Plasti Dip would be kinda scary to work with since it's basically liquid plastic and the can has warning labels like "extremely flammable vapors." However, once I got set up outside, it wasn't a big deal. The smell is a bit like spray paint and not as strong. Just use the Plasti Dip outside, dispose of it properly, don't eat it and you'll be fine! By the way - my knobs are painted white because I was going to do a "dipped" look but I did't like it so I opted to cover the entire thing with Plasti Dip using a small paint brush. This next part can get a little tricky. 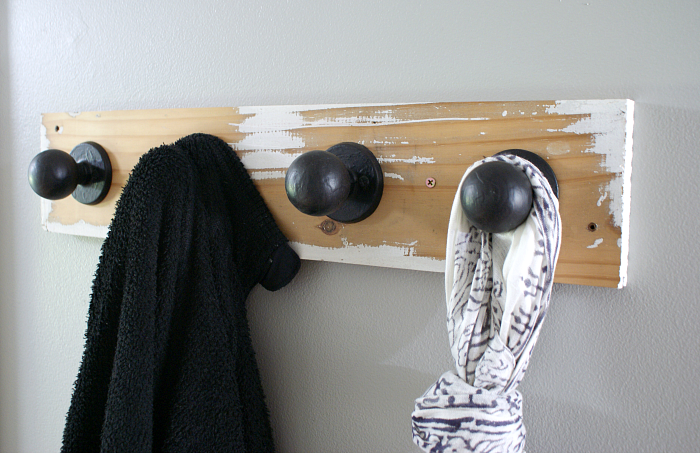 When shopping for secondhand knobs, try to find those with interior hardware that will "pop" out. It's kinda hard to explain, but some are all once piece and you want the kind that have spindles and screw posts soldered into place. We used a pair of vise grips to carefully wiggle the parts back and forth until they came off. Each pair of knobs will have one side with screw holes and one side without. To make the side without holes work, use a drill (or drill press) to add them. Side note - I drilled out the second hole with Jesse's help - I'm like Rosie the Riveter over here! To mount the knobs, we used a salvaged board from some old built-in shelves we recently took down. The shelves were painted white, so Jesse ran the board through his planer to smooth it out and remove most of the paint. I love the rustic / industrial look that having some of the old paint and holes showing gives it. We measured and evenly spaced the knobs and then screwed them into place. I covered the screws with another dab of Plasti-Dip and let the piece dry for about an hour before mounting it on the wall. You can see below that Jesse simply drove screws straight through the board into the wall. Easy Peasy. However, if you plan to hang really heavy bags or coats, I would recommend using drywall screws as well. 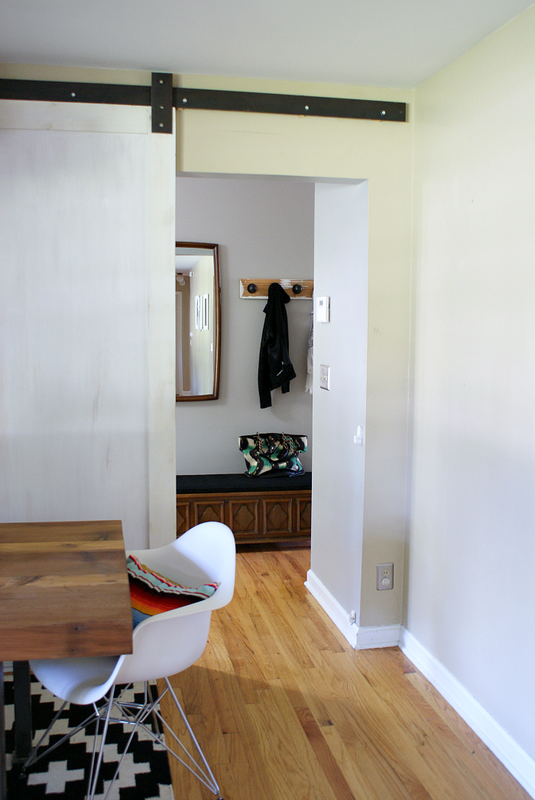 Here's a little peek at the neat mid century storage bench I found - it's cedar lined! I plan to fill it with blankets and maybe add a couple toss pillows to the top. You really can't have too many toss pillows! Also, remember how I said we need a place for keys and mail? Jesse made a nifty little box from the same salvage wood that we plan to mount under the mirror. I don't think he took photos for a tutorial while he was putting it together, but it will still be fun to share some pictures of it and the final "look" of the entryway here soon.